It’s been well over a month since we arrived back home with David and Mihret. Oh yeah, I suppose I should mention the name change... While we were still in Addis, we asked Manyazewal if he would like an English name, then started down the predetermined list Julie and I had settled on “…like David, or Daniel, or…” We didn’t make it past David before he started jumping up and down laughing with glee, “David? Really? DAVID?? YES DAVID!! ME DAVID!” You have to picture it in your mind with increasing volume and pitch. He was a little excited… We did keep Manyazewal as his middle name, which is good since Mihret still calls him by it now and then. Anyhow, it’s been some time since we’ve returned, and it is this account of our trip home that has been keeping me, well, blocked. I’ve tried and tried to weave it all together into a nice, neat, well-flowing account, but I’m stumped. But I don’t feel like I can write about anything else until I have faithfully recounted this last bit of the trip, and our experiences (and my thoughts) just keep coming. So here it is, in all its raw, unpolished messiness. I wish I had the pictures to give you a glimpse of these wonderful people. I can see them still in my minds eye, and when I do, I give thanks. There were the drivers. I know they make their living from shuttling people like us here and there. But each of the three different drivers gave us far more than what we contracted for. It was never just business, never just a fare. They spent extra time talking with us, and, more importantly, talking with David. They explained to him in Amharic what to expect on the trip and in America. They joked with him. They reminded him to mind his mom and dad, to be a good and honorable boy. They blessed us, thanking us not for the patronage, but for the gift we were giving the children. There was the couple we met at church. They’re from Whidbey Island (in fact, they lived not more than 5 minutes from where I grew up) and had adopted a son from Ethiopia some years ago. They have just moved to Addis Ababa to stay with him for awhile. They shared with us how their son had changed their lives, and how they had gone from being the teachers to the learners as he brought them to live in his culture. Their joy was an encouragement. Once we had finished packing, we stopped by the orphanage one more time. 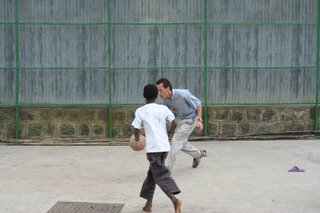 While I had a mild heart-attack trying to play basketball with some of the boys (Addis Ababa is about 8300ft in elevation) Julie sat and talked with some of the other kids and one of the volunteers. The older kids once again surrounded us and blessed us by blessing our children. One on one with Haptamu. I had intended on sharing some of my admittedly pitiful knowledge of basketball, but soon found that I needed all my breath just to stay on my feet. There was the kind couple after us in line at the airport, who held Mihret while we frantically unpacked and repacked our things because the airline officials needed to confiscate Mihret’s Benedryl (even though the signs had all said “up to 4 ounces” were allowed, and Mihret had a visible rash.) They were from Canada, and had new grandchildren adopted from Russia. 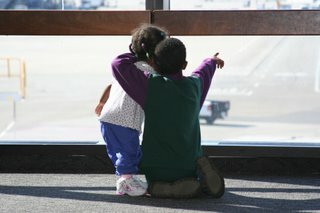 Every time they saw us in the airports or on the plane they had a ready smile and words of encouragement. There was the couple in line behind them, from Florida. They were in the process of adopting from China, and would be leaving (they hoped) in about a month to pick up their little girl. Their hearts had been transformed by the time in Ethiopia, and they felt called by God to come back in a few years to give a home to an Ethiopian child too. Just sharing our stories was a blessing to us all. About 10 rows back on the plane was another couple who were on their way home with a 8 year old brother and 6 year old sister. They had adopted through a different agency and were heading back to Michigan (I think.) It was fun to chat with them about the challenges we were already facing. It was comforting to hear that someone else had a boy who kept switching the seat-back video from the one cartoon being offered to the “action” movie. On the other side of Manyazewal from me was an elderly woman. She looked like she was sewn from a wrinkled leather bag, with hands that knew work and a no-nonsense look about her eyes. She didn’t speak a lick of English, but we seemed to establish an understanding right away. For her part, she understood I was a helpless English-only American with an Amharic speaking boy in a strange situation, while, for my part, I understood her to be a skilled and experienced grandmother. A few smiles and nods and she was set free to unleash her “grandmothering” on David. The poor guy was surrounded and outnumbered. Even when my back was turned he couldn’t change the channel to the “action” movie because he’d get a scolding in Amharic (doubly difficult because he couldn’t pretend to not understand it.) At one point at dinner she was cutting his meat while I was buttering his roll… he didn’t stand a chance. Then there was the row of college age girls in the row behind us, all Ethiopians living in Seattle. They were more than happy to charm Mihret when we needed to have a break. Between the three of them, with their command of the language, their natural babysitting skills and their shiny jewelry, we were rescued from some potentially difficult situations. There were the airline personnel who saw our need and responded with more than professional courtesy. There were the kind people who adjusted their seats, their place in line, their path, to make our path smoother. A brave new world, just one more plane ride away. I suppose if there is a theme to be found in all this, its that we never would have made it on our own, but, thank God, we were never asked to. I am more convinced now than I ever have been, that when God asks you to do something, more help than you would ever need will be given at the same time. Beautiful! You caused me to think back to my own experiences, back in April, bringing home our baby girl. You are absolutely correct. Oh, He is faithful, isn't He? !